Yes, Intel has plans for wearable computing. Intel used its Intel Developer Forum here on Tuesday to launch the Quark family of devices, a synthesizable family of embedded devices designed for embedded applications like industrial designs and wearable computing, which Intel executives said will be built by third-party partners, not Intel itself. Intel also began setting the stage for "Bay Trail," a new generation of Atom processors that will appear in a variety of products, like phones, tablets and convertible tablets. Intel also showed off a PC running Broadwell, Intel's next-generation processor technology; launched a new Xeon chip; and showed off a low-power fourth-generation Core processor, known as Haswell, that doesn't require a fan. Finally, Intel also showed off phones with its next-generation 22-nm mobile silicon, plus LTE communications technology. 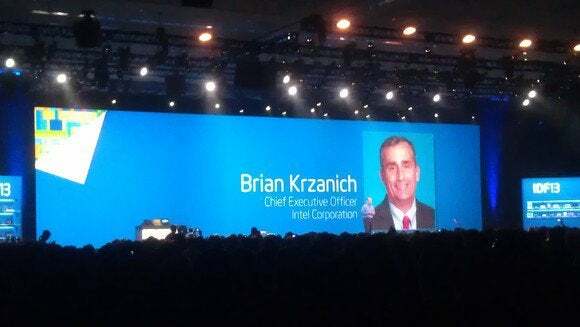 The Intel Developer Forum was the first for Intel's new chief executive, Brian Krzanich, who was named to the top spot this past June. Renee James, who was a frequent speaker as Intel's software chief, was named president at the same time. "Our strategy is really pretty simple: we plan to lead in every segment of computing," Krzanich said, including, servers, PCs, tablets, phones, and beyond to wearables, he said. Some of the tablets and convertibles Intel showed off that use (or will use) Intel silicon. Krzanich's job is to oversee the transition between Intel's traditional strengths in the PC and server business, and to a slightly lesser extent, in the mobile PC market as well. 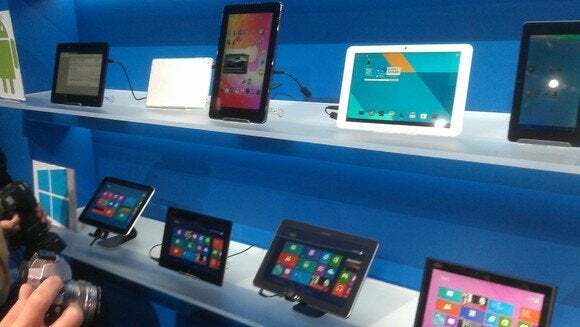 Analysts have predicted that the PC will slowly decline, however, as consumers turn to ultraportable devices: two-in-one ultraportable machines, true tablets, and smartphones. Perhaps telling is that an agenda Intel provided to reporters before the start of the show didn't include any press conferences specifically focusing on Intel's Core PC microprocessors. Instead, Intel's emphasis is on the datacenter, where the vast majority of servers ship with Intel's Xeon inside, and on a new Atom chip code-named Bay Trail for tablets one of a family of "Silvermont" chips aimed at everything from microservers to, eventually, in-car entertainment systems. And Krzanich took to the message with gusto. "Transitions to mobile will be good for the industry, good for Intel and good for Intel's developers," Krzanich said. Krzanich began by talking about the data center, which Intel attacked last week with its Avoton and Rangeley chips, both Atom based processors designed for the datacenter. Krzanich said that Intel would announce the Xeon Z5, the more traditional "Big Iron" silicon that powers most of the world's servers. For her part, James said that applications like personal healthcare will require massive amounts of data; for example, one person's genome requires a petabyte of data. But institutions like the Knight Institute have found success in tailoring cancer treatments to specific genetic factors, and Intel fellow Eric Dishman appeared on stage to tell the audience that genomic sequencing of his cancer had allowed his doctors to successfully treat it. Intel also has plans for the other end of the spectrum: wearable computing embodied by products like the Pebble smartwatch and Google Glass. "So yes, we have been working on wearables," Krzanich confirmed. "The idea is not that Intel will bring wearable products to market, but to come up with devices for Intel's customers to come up with their own products for this ecosystem and drive these products into the market themselves," he said. But Intel will also build some prototypes, so that the company knows what its customers want. "We could only do that if we we had the reference designs," Krzanich said. Intel announced the Quark family of silicon, the smallest system on a chip Intel has ever produced, Kranich said: one-fifth the size of the Atom and operating at one-tenth the power. It is fully synthesizable, and designed for the Internet of things. The Quark X1000 will be the first of the lineup. Intel has reference designs for industrial boards, to connect to machines, back to the Internet. SInce the device is synthesizeable, customers can put their own logic and peripherals into the design. They won't be able to tweak the core design, however, just attach their own logic at "attach points" integrated into the silicon. That doesn't mean that Intel ignored the PC. Krzanich showed off a fourth-generation Haswell-Y device, running at a miniscule 4.5 watts, that does not require a fan. "This provides the battery life, the weight, the thin[ness]," Krzanich said. "Looking back a few years ago, if you said we'd see fanless Core-based processors, you'd be surprised. But they're here." Mini Windows tablets like this Toshiba model will use low-power Atom chips. Krzanich said that Intel's silicon will be in 60 "two-in-ones" or convertible tablets, by the end of the year, with prices as low as $400. And Krzanich ent a step further, saying that Atom-based tablets could be priced less than $100. "Our plans are to have 14-nm Atom at the end of next year," Krzanich said. Intel's eventual target is the smartphone. Intel has tried to push into phones with the "Clover Trail+" Atom chip that it released last year. But save for the Lenovo K900, a phone released for the Chinese market, Intel has had little success. In part, that's because Intel is still developing the collection of technologies needed to design an integrated system-on-a-chip that OEMs demand, as it saves board space and power. Intel has announced multi-mode LTE technology that should help it penetrate worldwide markets, but has yet to integrate it with its Atom silicon. Intel said it had 22-nm silicon for phones, however, and James characterized its phone processors as more powerful than a Pentium 4. For her part, James has led an often-overlooked portion of Intel's business: software and tools, specifically the embedded OS. One of those has been Tizen, the open-source phone OS championed by both Intel and Samsung. Neither, however, has pushed Tizen much past the drawing board, and James didn't mention it. As computing is getting more personal and connected, Krzanich said, the need to have a single architecture on a single piece of silicon becomes greater. Capabilities like connectivity and communications becomes even more important. "And we look at this and say, this plays right to our strengths," Krzanich said.